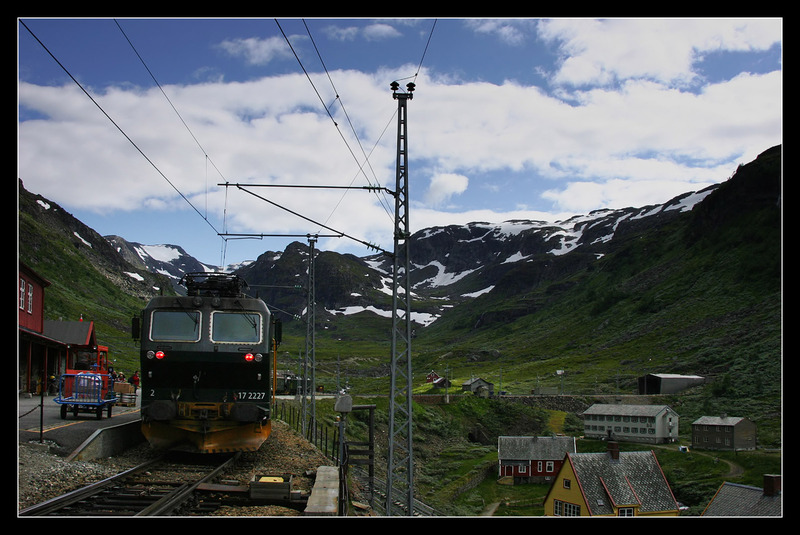 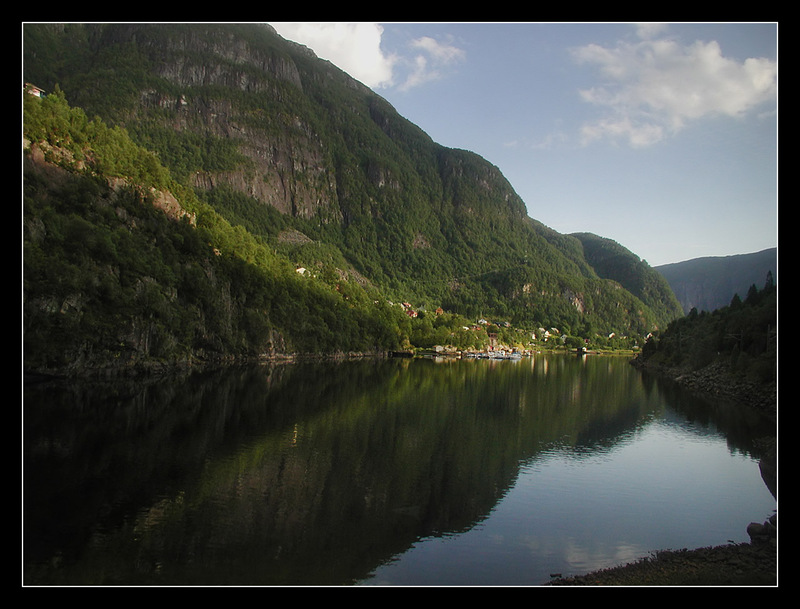 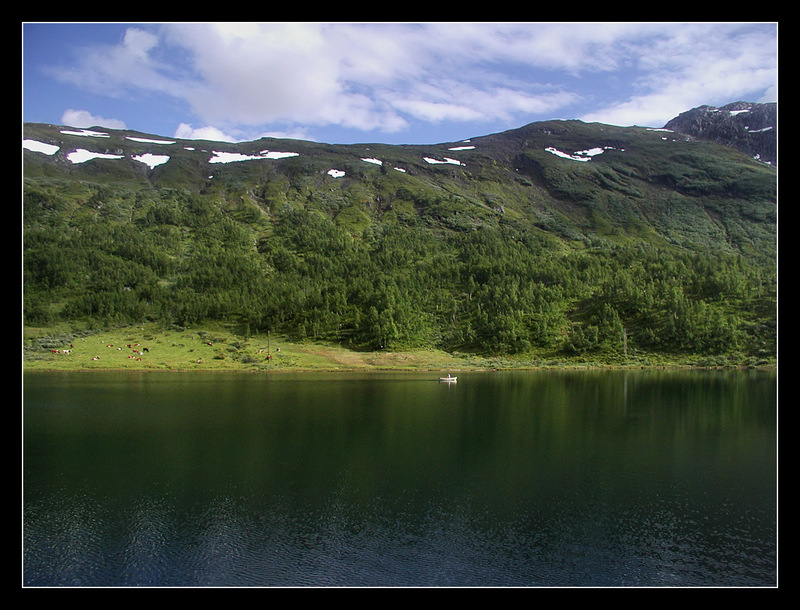 In the afternoon, we had hiked from Flåm Railway stop Vatnahalsen to the mainline junction Myrdal. 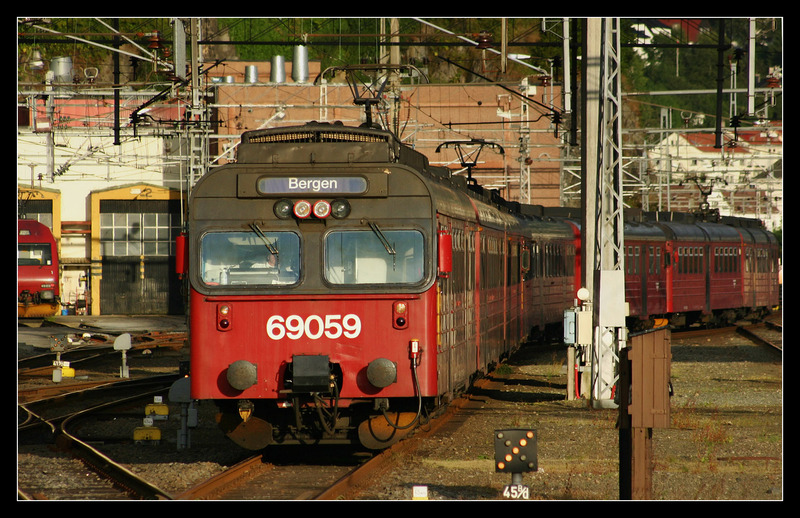 The next Flåmsbana train was about to reach its terminal. 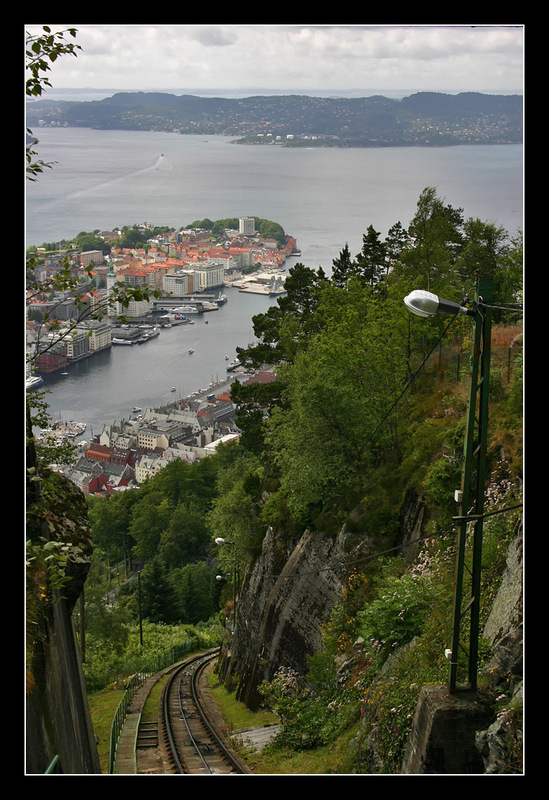 You can clearly see the steep grade on this pure adhesion line, to the right the tunnel of the Bergen Line from Oslo. 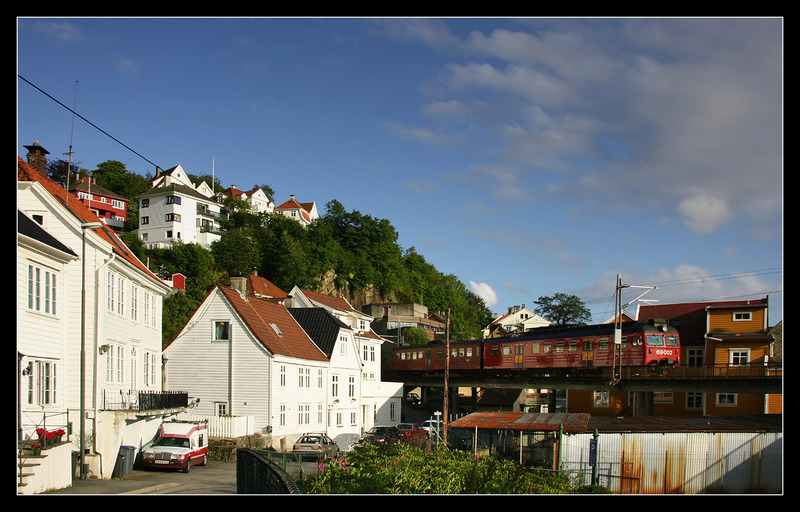 View of the mountain railway settlement Myrdal and tunnel towards Bergen in the background. 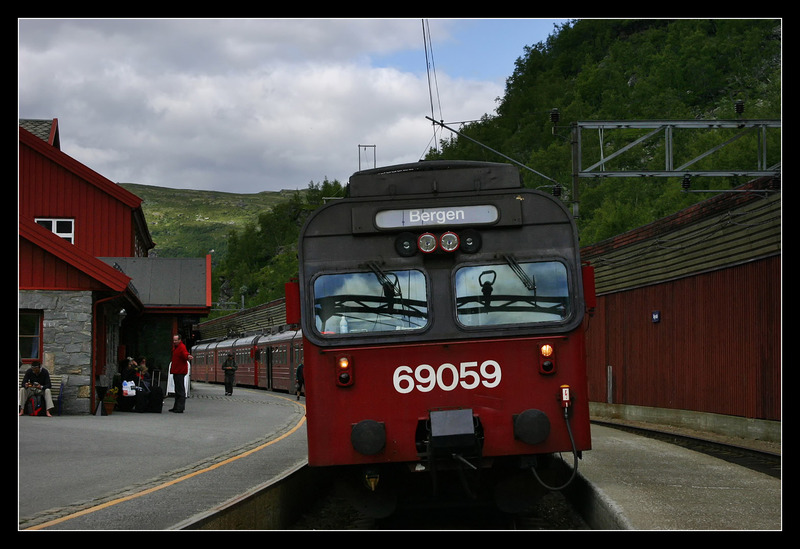 Shortly after 5 p.m., we boarded a local connection from Myrdal to Bergen operated by EMU class BM 69. 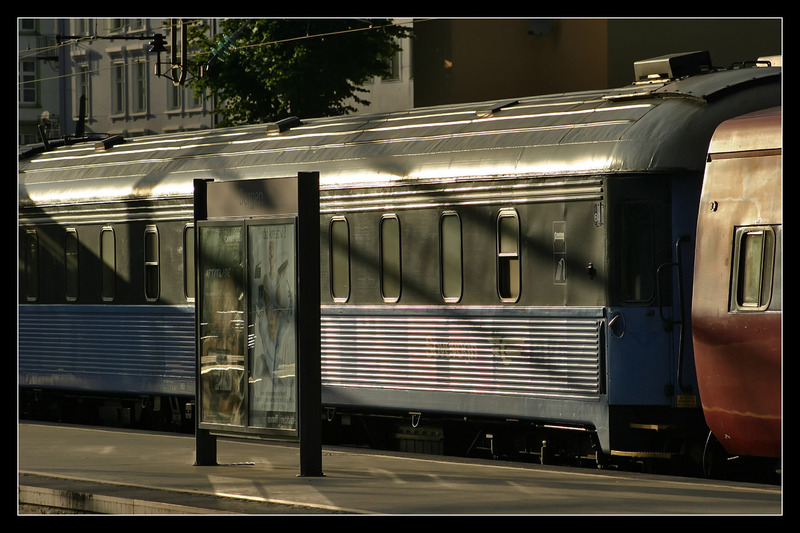 This is a D-series train, produced 1983-84. 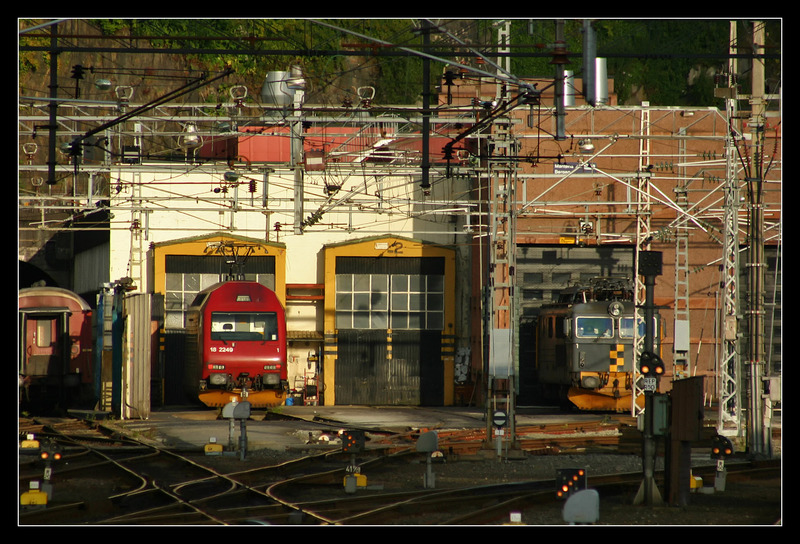 Waiting for a crossing at Reimegrend. 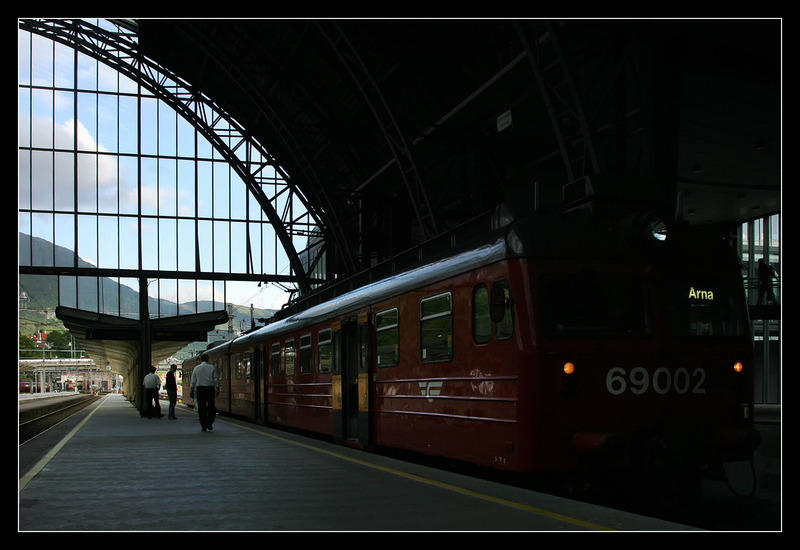 One hour stopover at Voss, even if the same train continued. 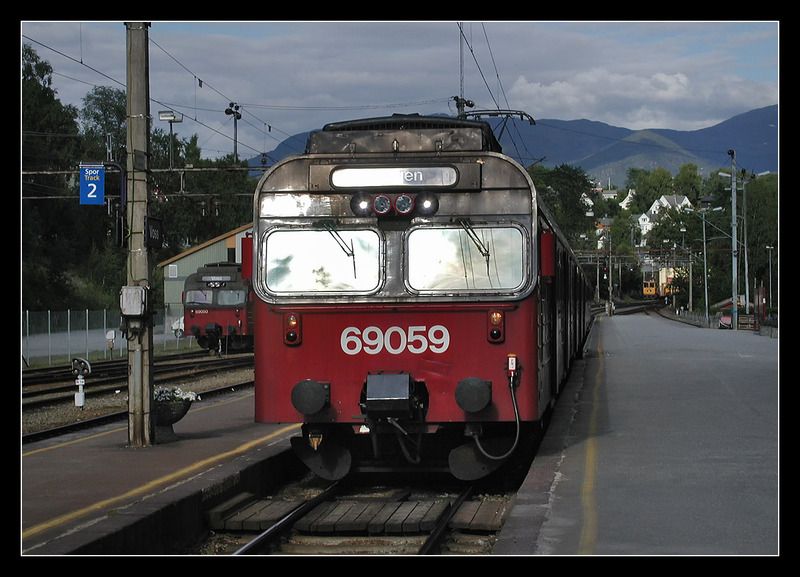 It was coupled to form a three-part EMU, the middle BM 69 to the left with visibly older front design belongs to the B-series (built 1974-75). 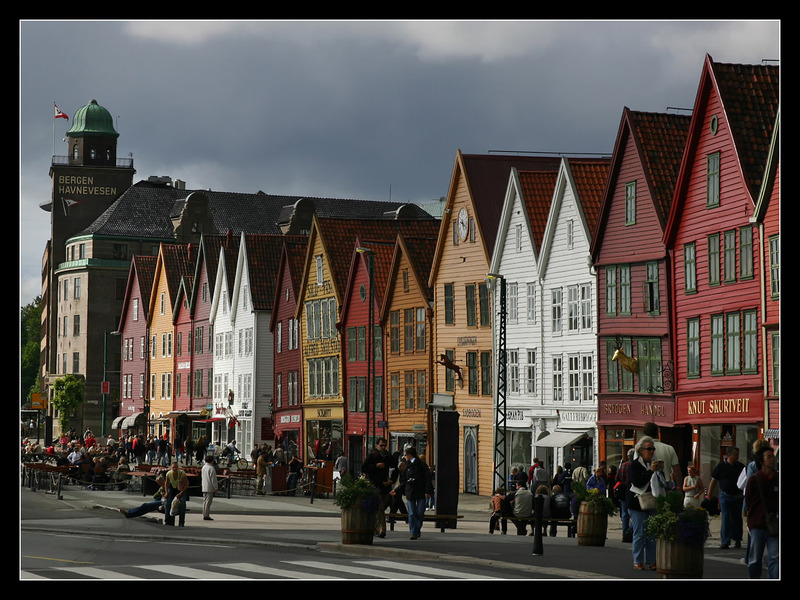 We passed Dale, the mecca of the Norwegian sweater. 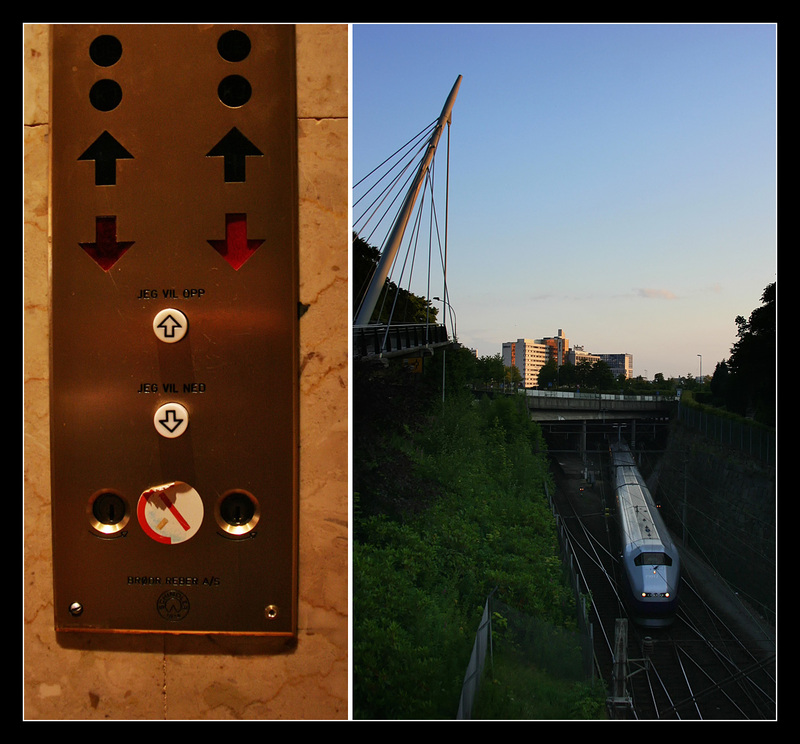 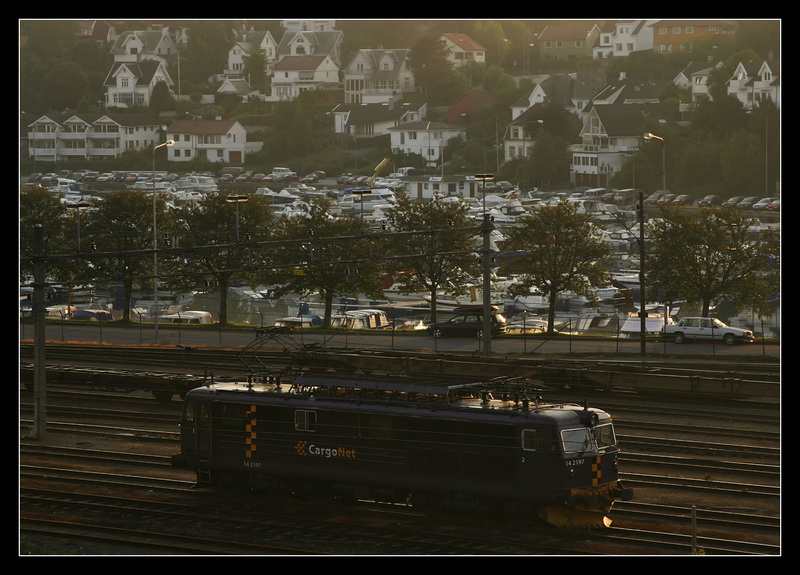 The evening before, I had explored the line through Bergen. 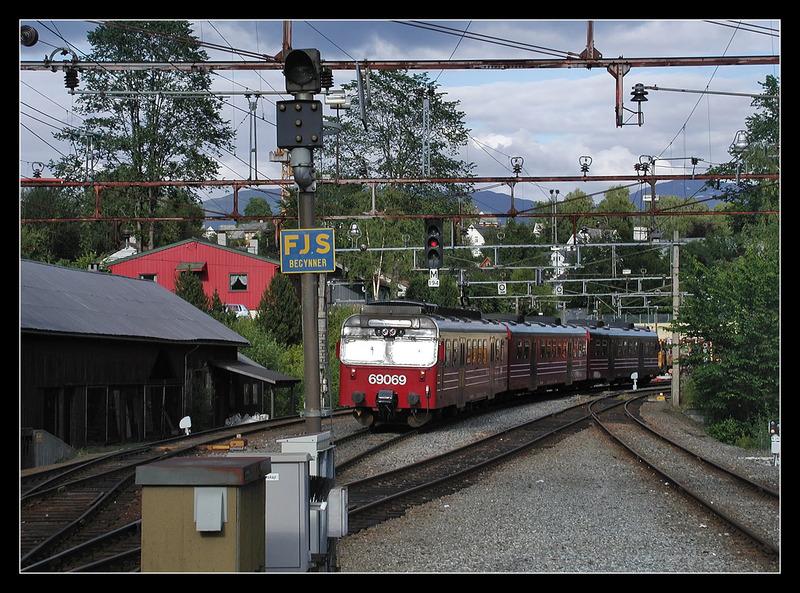 The shortest commute connected Bergen to Arna through 25164 ft long Ulrikstunnel operated by two-part BM 69002, one of the earliest of its class from 1970. 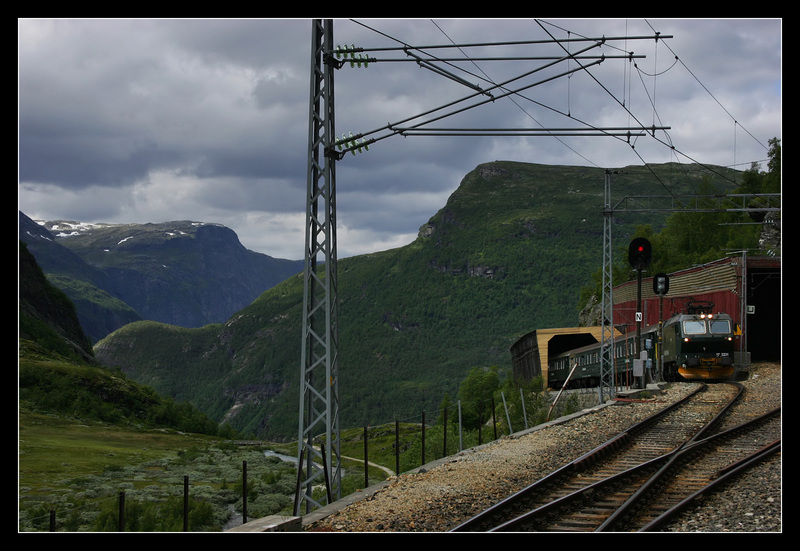 The train from Myrdal, which we were about to take the next day, arrived at 8:36 p.m.
View towards the station hall with driving van trailer BS 69620 of the EMU to Arna. 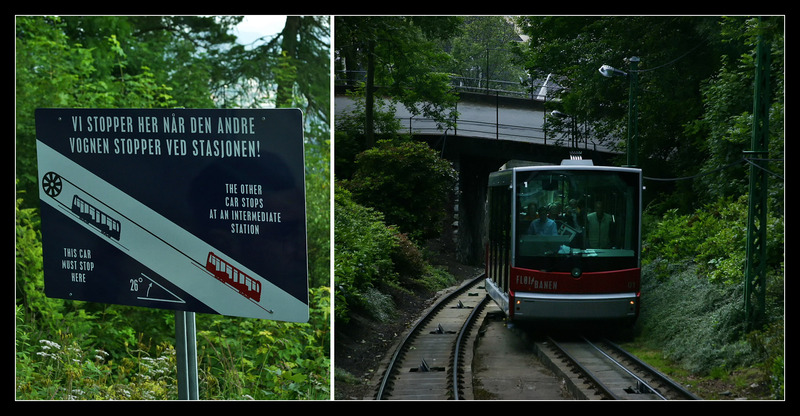 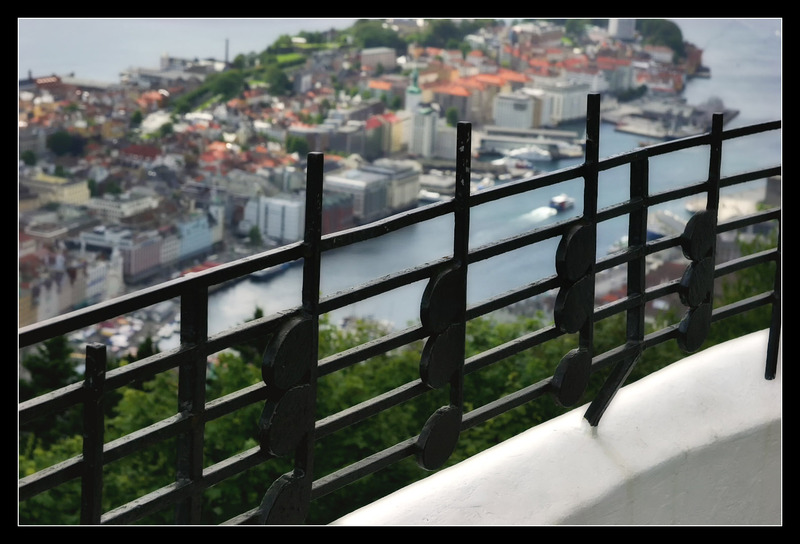 In the afternoon, we took the funicular railway Fløibanen up 1050 feet high Fløyen. 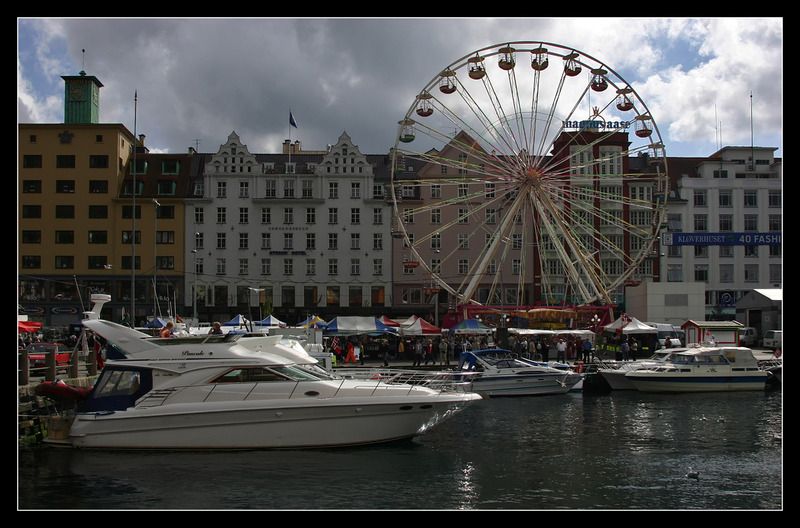 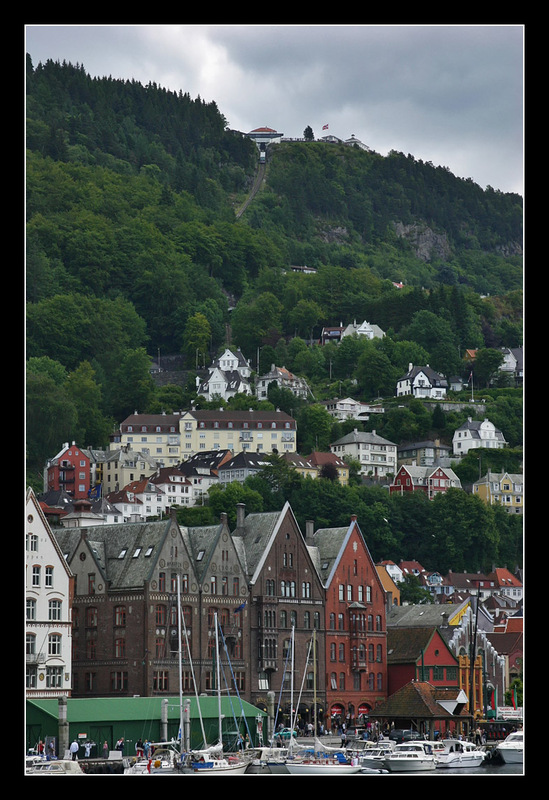 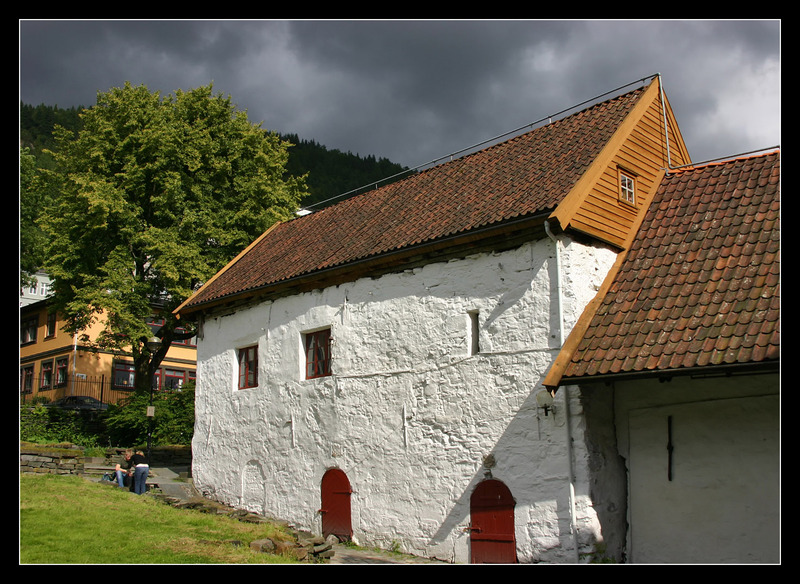 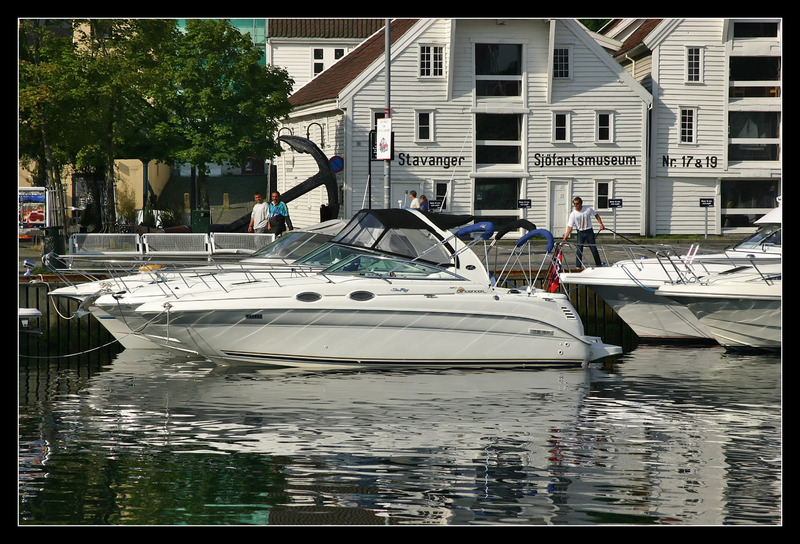 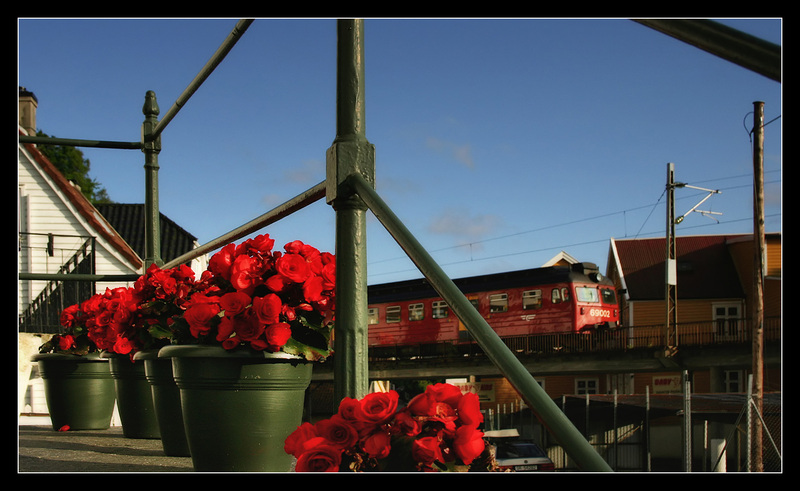 Bergen is the home town of composer Edvard Grieg. 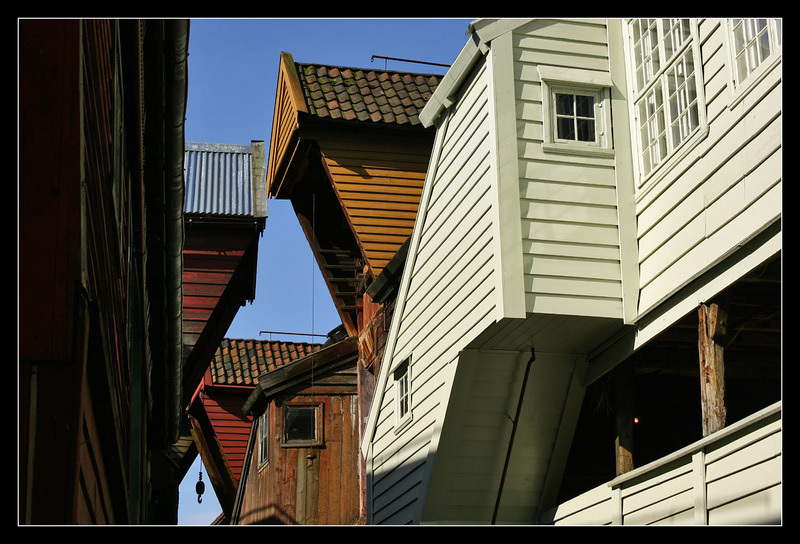 Most important sight is the former Hansa quarter Bryggen ("pier") with its wooden countinghouses, a UNESCO world heritage site consisting of about sixty buildings. 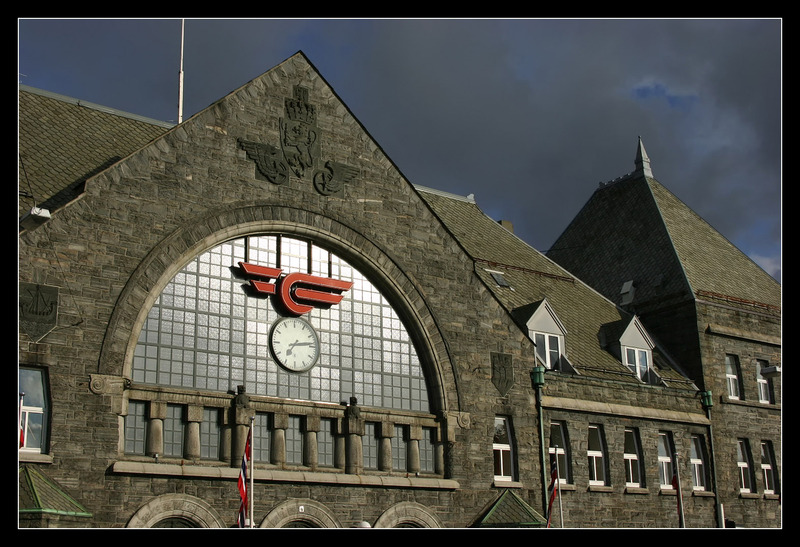 Impressive Bergen station in national romantic style had been opened in 1913. 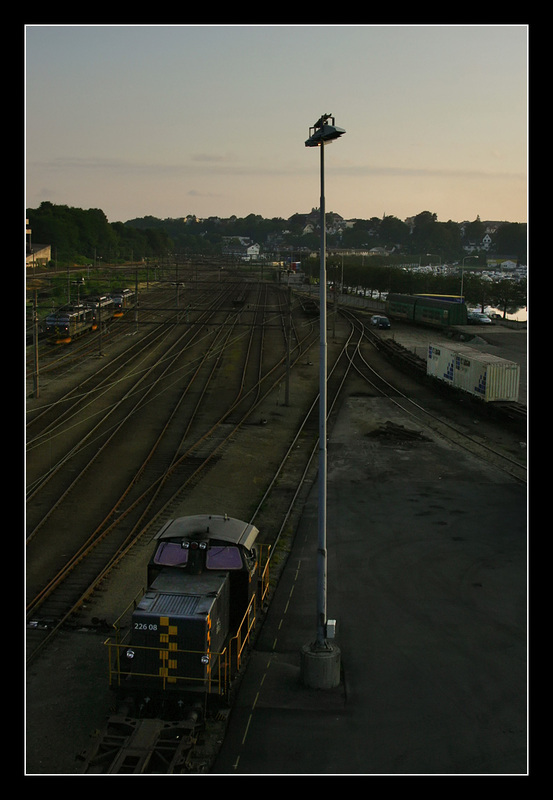 View from the end of the platform towards the engine depot. 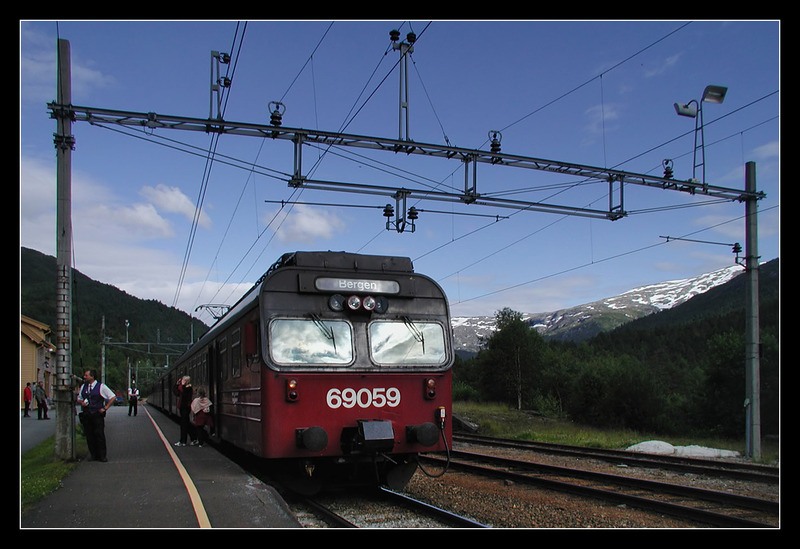 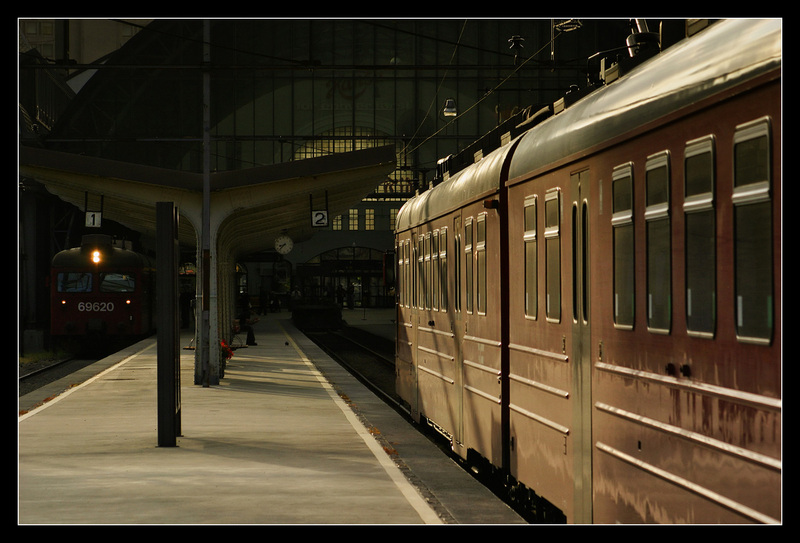 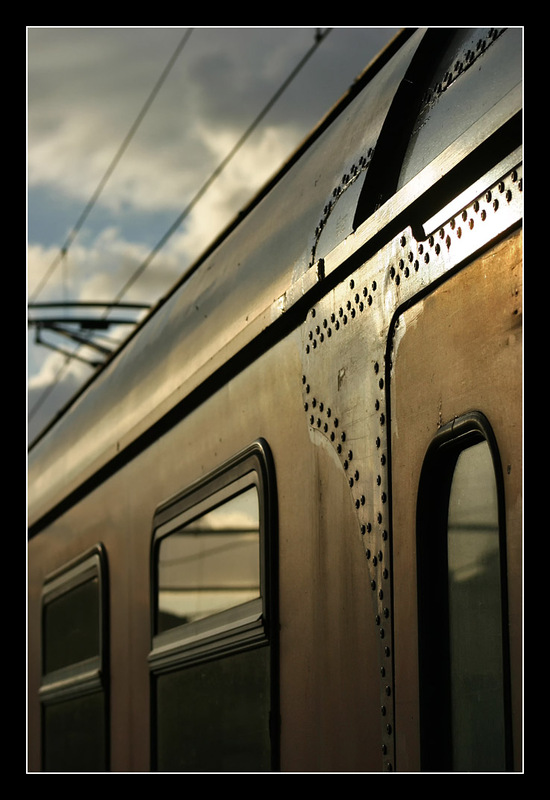 At 8:30 p.m., night train 606 to Oslo departing at eleven was shunted to the platform. 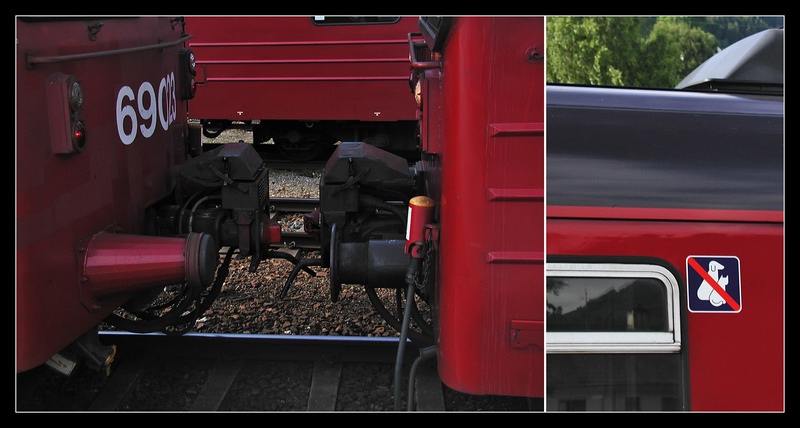 Sleeper in SJ livery with NSB logo and shower. 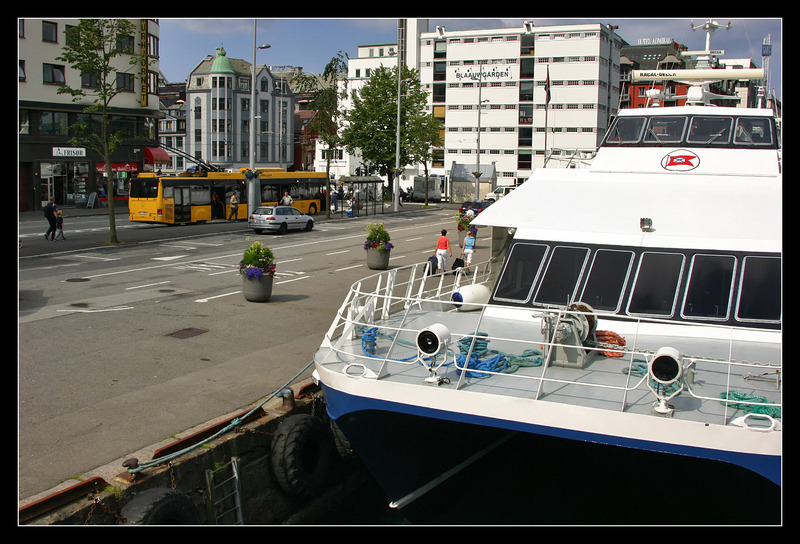 The last morning in Bergen greeted us with sunshine. 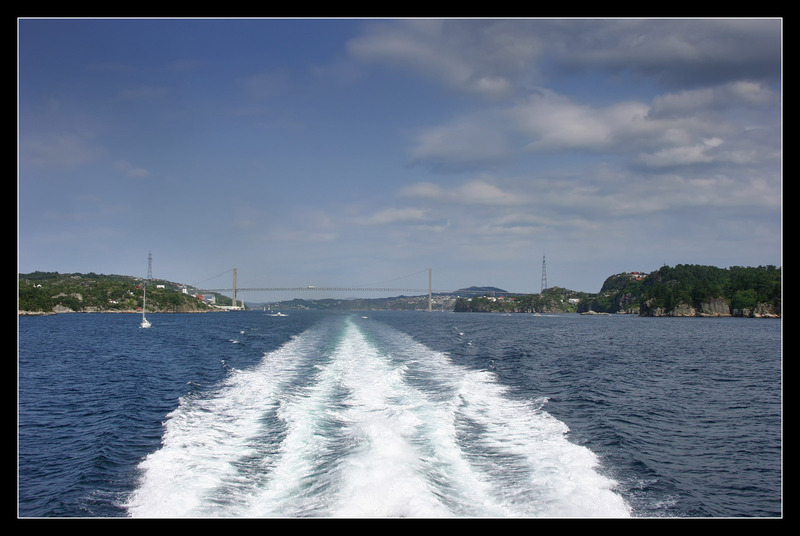 No railway connection for the next leg of the trip - so we changed to a fast ferry. 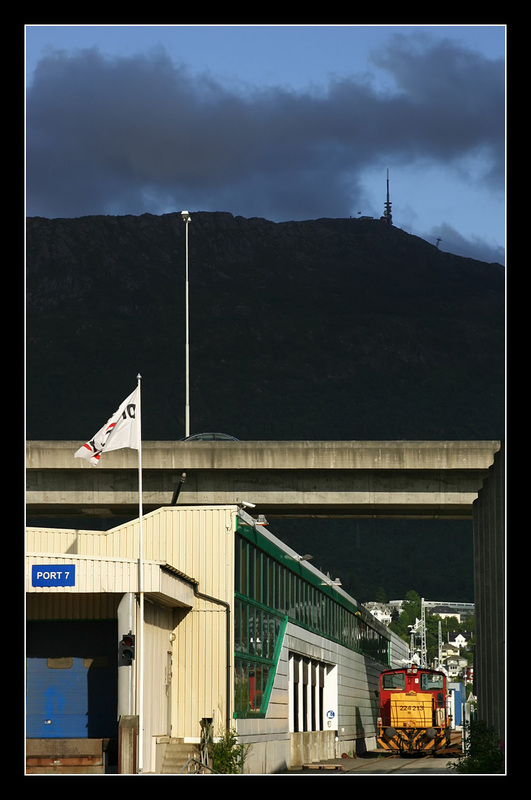 Bergen is home to the last trolleybus operation in Norway, from deck I spotted this latest generation Neoplan/MAN N6321 Electroliner, just delivered the year before. 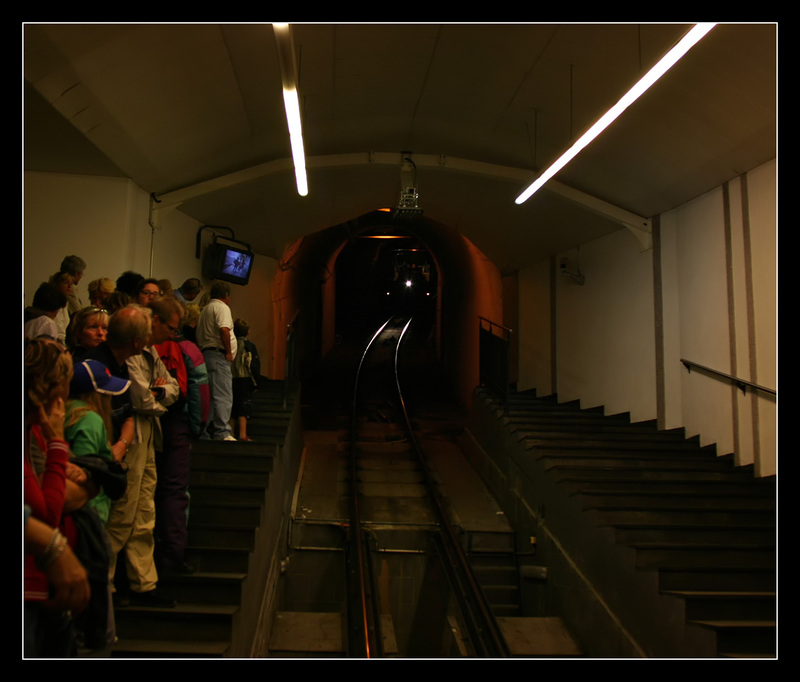 The tram line only has been built since 2008. 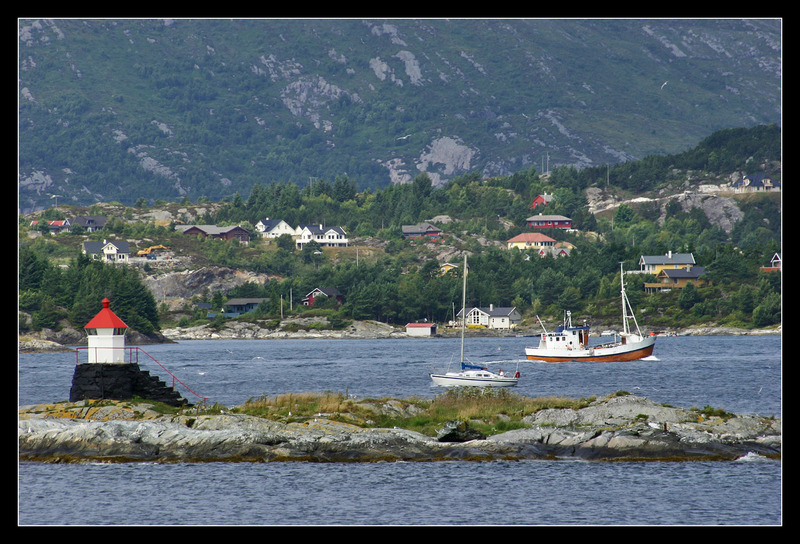 Fløibanen view from the harbour. 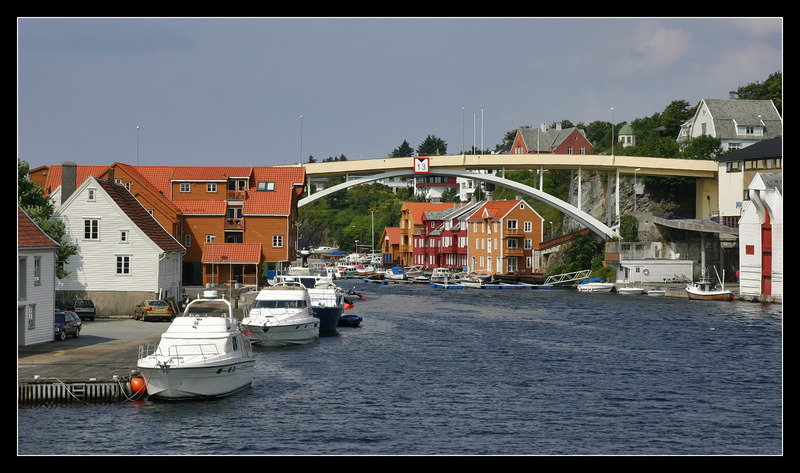 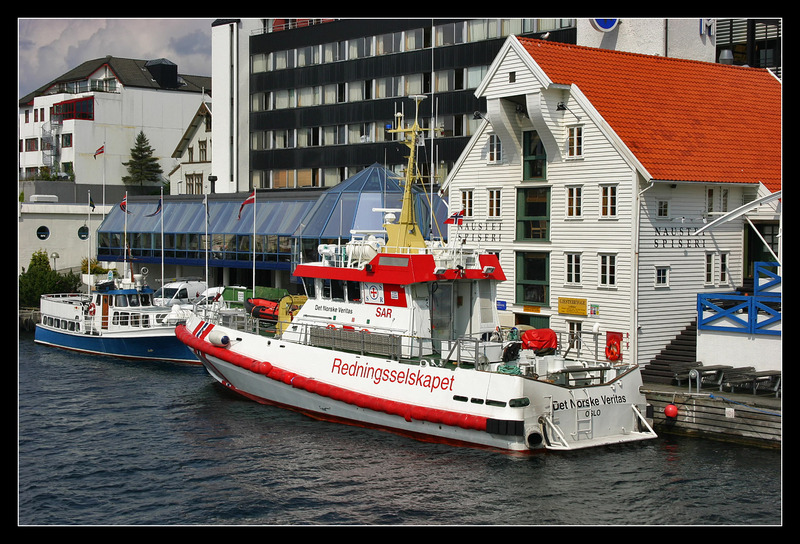 We got to know a different Norway than on the tour until now: flat islands, the town of Haugesund is crossed by ship. 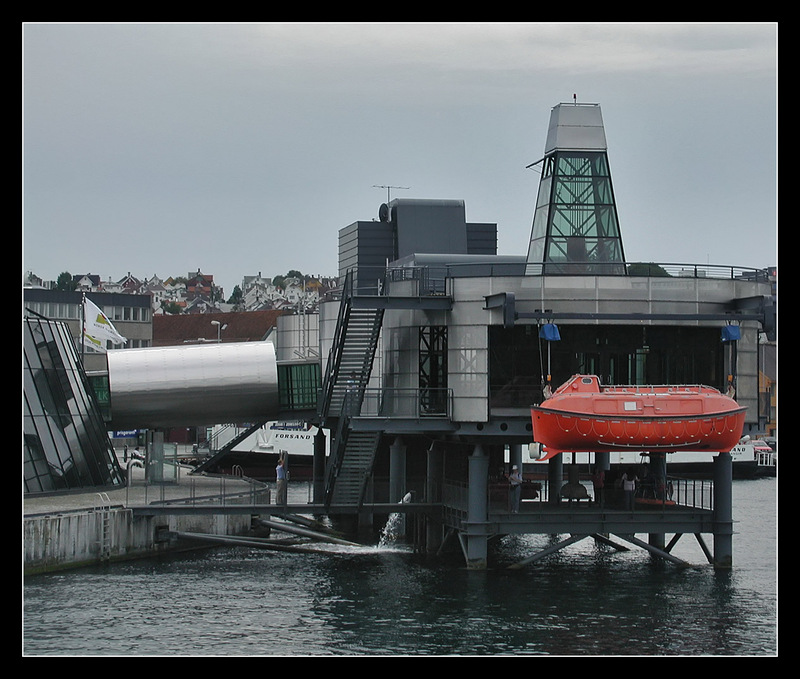 We reached Stavanger: this museum shows, what it is all about nowadays: North Sea oil. 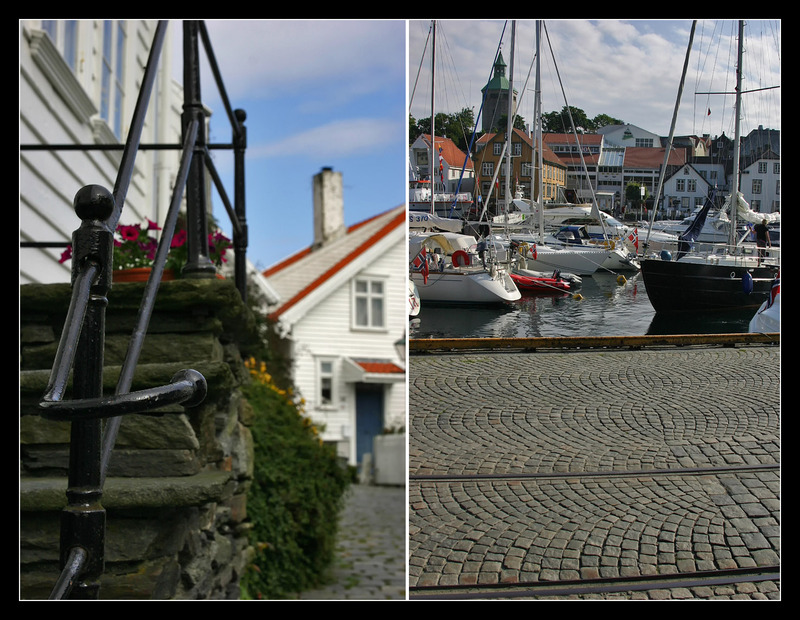 The old harbour quarter of the town. 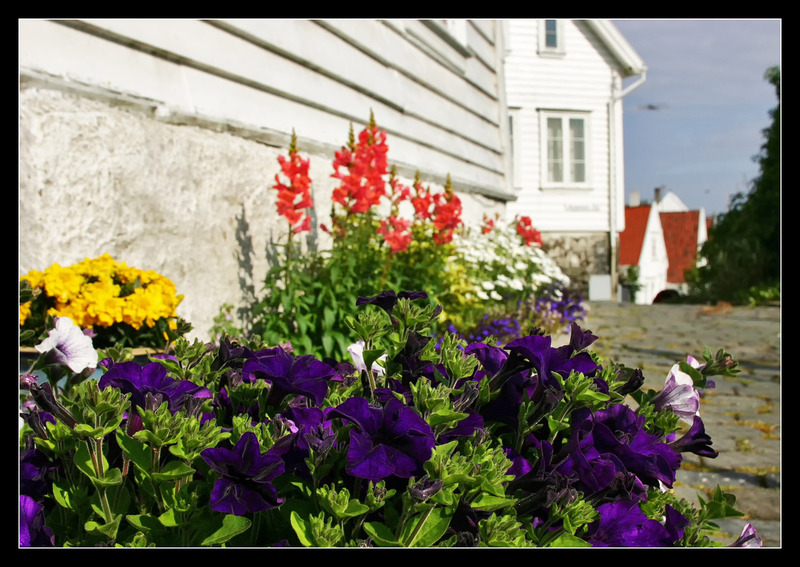 Gamle Stavanger around Strandgate is dominated by lovely white wooden houses and an abundance of flowers. 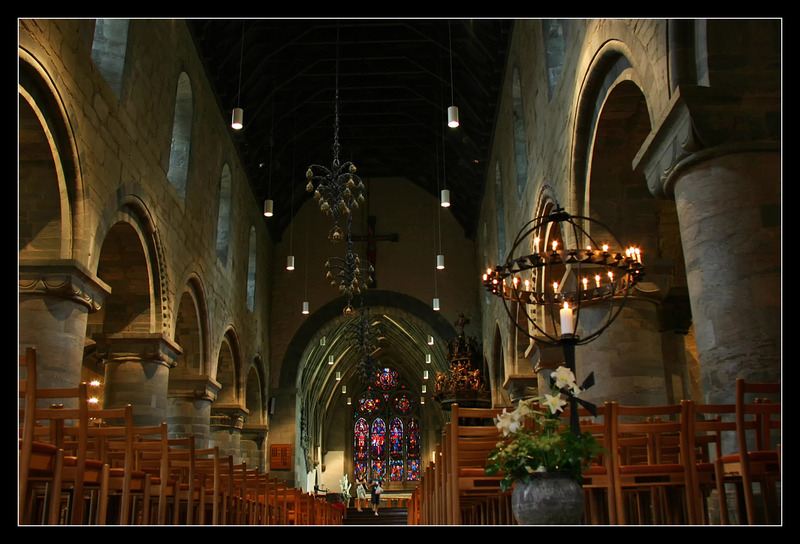 Stavanger Domkirke from 1125, the oldest episcopal church in Norway. 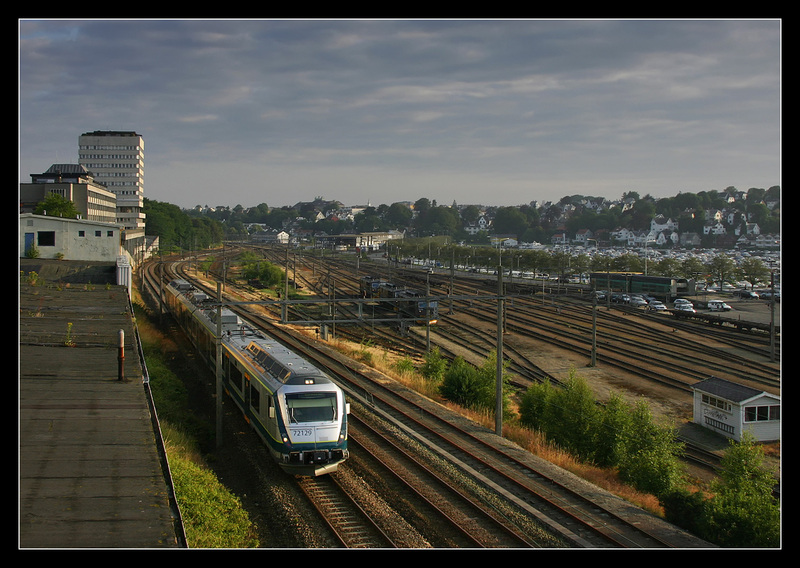 I got up early for train 776 Stavanger - Kristiansand / Oslo departing the unphotogenic modern station shortly after 6 a.m.
Luckily, the line soon reaches the waterside. 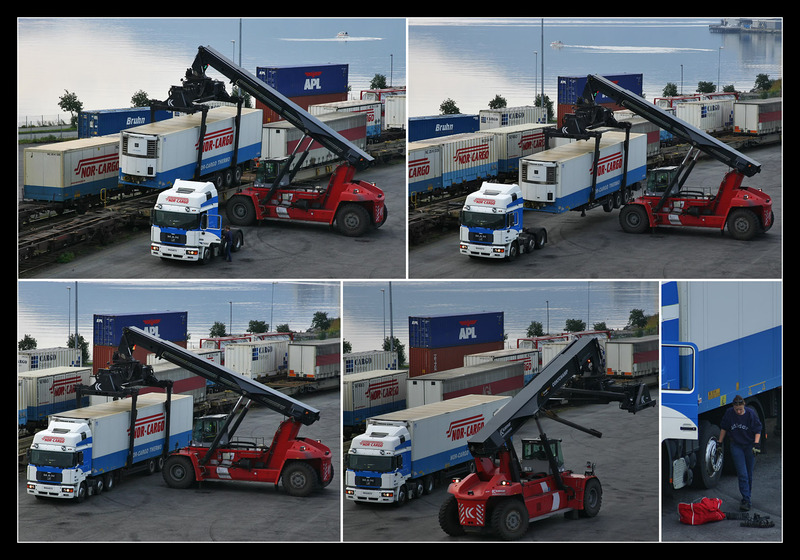 Car and container loading at this terminal. 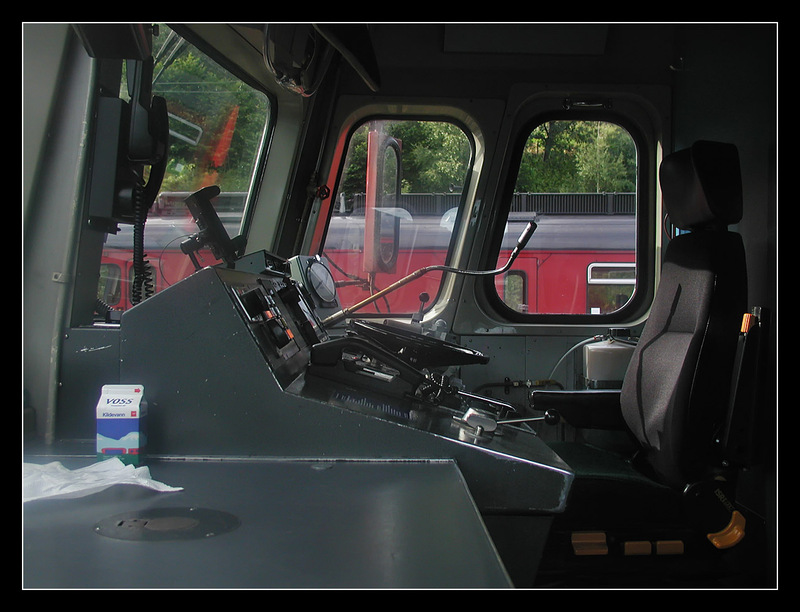 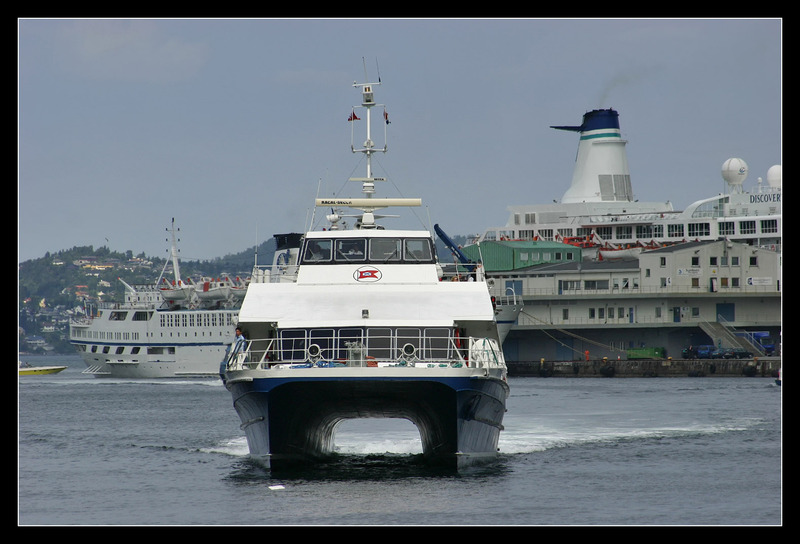 Norwegian intermodal transport - in Scandinavia of course with female trucker! 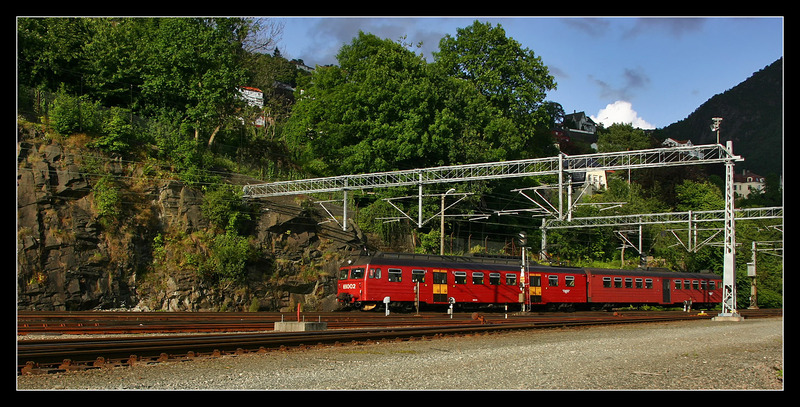 Local trains from Stavanger were operated by class BM 72, then newly built by Ansaldo Breda. 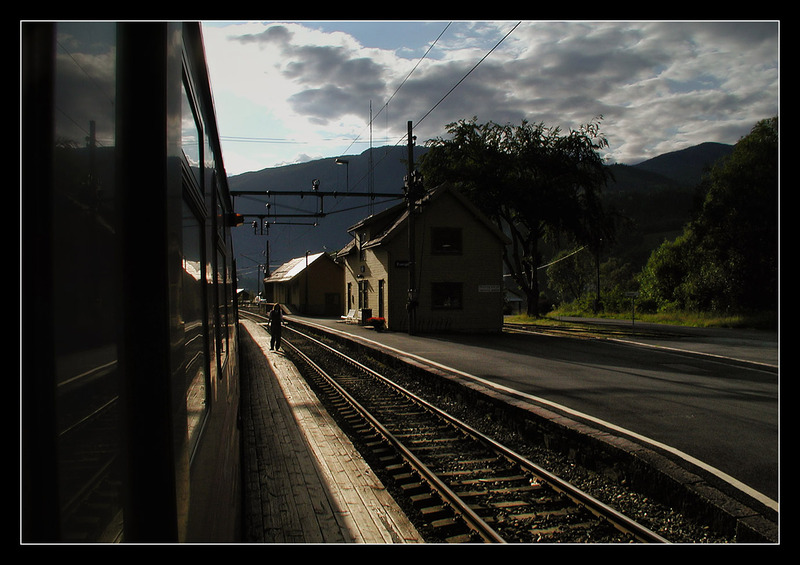 At this spot nowadays the halt "Paradis" has been constructed. 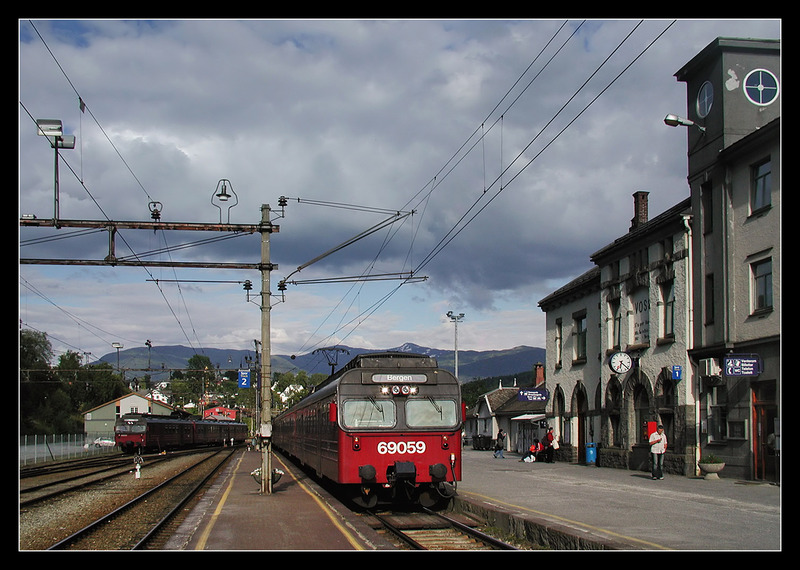 Sleeper train 705 from Oslo arrived shortly after seven o'clock. 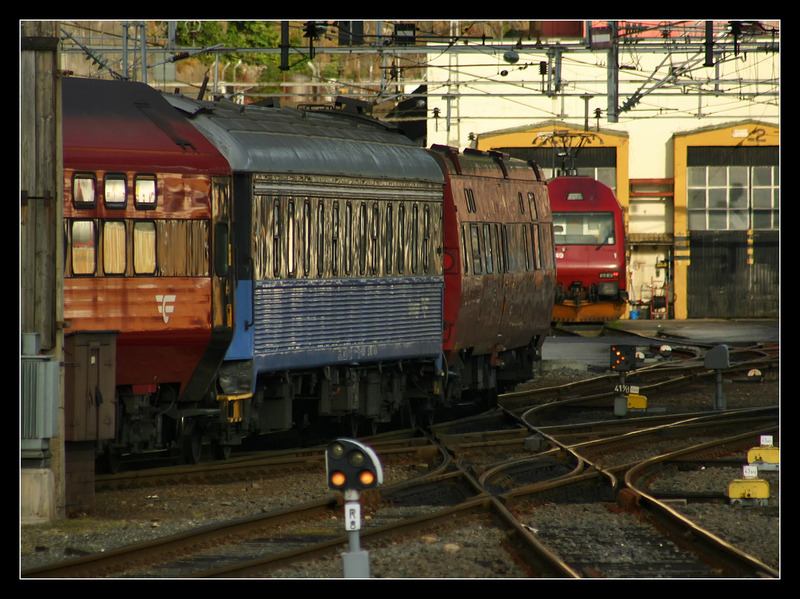 An NSB old B3 generation WLAB was followed by a newer WLAB-2, behind it an SJ sleeping car in NSB livery.